A fine trip, Chris. Reading your posts about Scotland always makes me want to come there immediately! Maybe one day, hopefully this autumn or next spring. It's good to go to the hills to photograph them - it makes for a completely different route selection and gives you time to sit and savour the place. Having said that, I would be very careful where I would be camping - that picture looks like you chose a midgie paradise; slightly sheltered and all boggy long grasses! I might have been tempted to take the two extra Scarp poles and camped up nice and high; somewhere more breezy! You are of course right Alan! The site wasn't actually very sheltered - as I discovered during the storm. As I wanted to wander from corrie to corrie - the different route selection you mention - a higher camp would have been inconvenient. 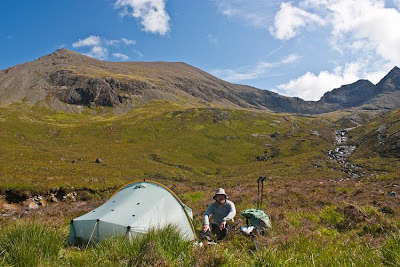 Also, the Cuillin isn't really the place for very high camps and I didn't fancy a stony bivouac. I'm glad I wasn't high up in the storm! Looks very peaceful and re-energising. Is that tent more than just a one man tent? Looks quite large! Unless it is my monitor!! I took Sue to Dartmoor the other day, wow, did that bring back memories, how I forgot how wonderful open spaces are. I can see myself walking up the mountain behind you, looks a grand walk. Is that where compasses don't work? If so, might get lost! PS - the midges put me off!! Tony, the tent is a Scarp 1 and it is a solo tent. It's quite roomy though and has two porches. Compasses don't work in some parts of the Cuillin if you hold them near the rocks. Taking a few bearings away from the rocks usually works though. You do need good route finding abilities in the Cuillin as the terrain is so steep and rocky. Go wrong and you can quickly find yourself in difficult and dangerous situations. Has the Scarp replaced the akto as your tent of choice...? Paul, not necessarily! It depends on the trip. Also, I am still testing the Scarp. I wanted to see how it performed when the midges were biting as I wondered if midges would come in under the raised flysheet. They didn't, at least not in any significant numbers. And a smoking mosquito coil soon cleared them. If heavy snow was likely I would choose the Scarp with the crossover poles as it is more stable than the Akto in those conditions. However I still prefer the larger porch on the Akto and the down to the ground flysheet. I also have other favourite shelters - the GoLite Hex 3/Shangri-La 3, the GoLite Cave and the Kathmandu Trekking Basha-Tent - though I wouldn't use any of them in midge season. Ok, so let's say I want a one man tent that is light but roomy - which would I choose? Maybe one day I will head off into the hills and give Sue some peace. Depends when and where you are going to camp Tony! Outside of serious winter conditions the Akto is excellent and very tough and long lasting. The Scarp is better in snow and weighs less without the crossover poles. The Hex 3/Shangri-La 3 are incredibly roomy but not suitable when the midges are biting. Sounds like my attitude to buying things anyway then LOL ;-) I tend to get something and think oh that's better for a given situation and get something else! !